The latest SMILE leaflet can be downloaded here. 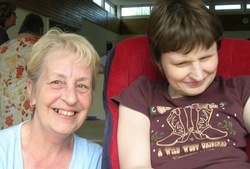 North Oxfordshire Day Service supports adults with learning disability in the Banbury area. We had two bases, one at Redlands and one at St. Johns Dupuis Centre. Over the years the abilities of the people we supported changed, and we adapted the service to meet their needs. After much research and partnership working with Adult Education, LDT and Ridgeway Partnership, SMILE came into being by responding and listening to people’s needs and how they wanted their service. A total communication approach was implemented and is now seen as an important framework to daily life. The SMILE approach used by Redlands has attracted much attention from providers both within Oxfordshire as well as nationally. If you are interested in setting up a SMILE group, Celia Chasey, SMILE Consultant is able to offer a start up pack which includes staff training and support in setting up initial sessions. SMILE currently runs six sessions a week: Monday pm, Tues am, Tues pm, Weds am, Thurs am & Fri am. Each session supports up to 5 people and their carers. Cost is £4 per session. The sessions are accessed not only by people at North Oxfodshire Day Services, but also by those supported by Southern Health (previously Ridgeway Partnership) as well as those receiving direct payments. Sessions are themed around aromas and the seasons of the year. The aromas we use are orange, mint, lemon, lavender, chocolate and vanilla. The aromas are burnt in the room and a CD – “When you’re smiling” – is played at the beginning, both being sensory references. The daily sessions provide a venue for interaction and communication which occur through the use of sensory stimulation using smell, touch, taste, sound and sight. In addition we use Intensive Interaction, pictorial symbols, Objects of Reference and Makaton to encourage turn taking, sharing, waiting, listening and making choices. We use sensory boxes, Soundabout (www.soundabout.org.uk), interactive story telling, songs and games, music and singing. Each day is structured to suit the people involved and led as much as possible by the people involved, taking into account their likes and dislikes. There have followed a number of additional projects and resources, all compatible with the work achieved through SMILE. These include using and developing Soundabout, Story groups, Objects of Reference, Sensory Referencing, a sensory room, communication passports and pictorial timetables. We are always building on these. Whatever we do, we try to remember that it is not the activity which is important but the interaction which takes place around it. We are continuing to develop ideas and celebrating every small step along the way – and having fun doing so! Anyone who would like to visit is welcome. To visit and see a group is really the only way to get a true picture of the achievements of everyone who uses SMILE. Project management: SMILE projects are overseen by Celia Chasey, SMILE Consultant, and carried out by Day Centre staff. Supported by: Psychology Department, Speech and Language Therapy Department, Southern Health. Attended by: Anyone who provides their own support for Southern Health, other Day Services and Independent Providers, North Cherwell Day Services. When: Daily, Monday – Friday. “Since joining SMILE my daughter has become much happier in small groups, she really enjoys the singing and music. Due to her poor eyesight the touch, feel and aroma sessions have opened up a whole new world for her. She has never tolerated physical contact but will now happily shake hands on greeting her friends. The sessions are very relaxed and friendly and she is allowed to participate, or not, in whatever way she chooses.” – Mother of a SMILE user.